Whether the cameras stay on or not is under the control of the House majority, so Ryan could have left them rolling. But he clearly wanted to deprive the Democrats’ protest of media oxygen and thought, presumably, that turning them off would produce a media blackout. What he got instead was a media firestorm. A young aide to Rep. Scott Peters (D-Calif.) suggested using Twitter’s Periscope live-streaming in lieu of C-Span. Peters downloaded the app and began broadcasting from his iPhone. Using electronic devices in the House chamber is technically against House rules (as is staging a sit-in for that matter) but Peters continued broadcasting as the protesting representatives chanted “no bill, no break,” a reference to the month-long recess Ryan had called. Confronted with breaking news — a rarity for C-Span — but cut off from its own video feed, C-span chose to defy the rules of engagement and grabbed Peters’ Periscope feed and put it on the air. 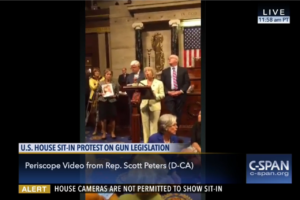 Though C-Span has used snippets of Periscope feeds before, on Wednesday and into the early hours of Thursday morning, it gave over hours of air time to Periscope broadcasters from Peters and a few of his colleagues that had also started live-streaming the sit-in, despite the unpredictable audio and the video’s somewhat erratic mise en scene. C-Span occasionally picked up a Facebook Live feed from Rep. Beto O’Rourke (D-Tex.) but Periscope dominated its coverage. The three cable news networks eventually followed suit, picking up various Periscope feeds, with CNN and MSNBC going wall-to-wall with their coverage and turning the House Democrats’ somewhat goofy sit-down strike into a major news event. Well played, Speaker Ryan. Meanwhile, the hashtag #NoBillNoBreak blew up on Twitter itself, generating millions of tweets in addition to the Periscope views. It was Twitter and Periscope at their best. Frustratingly, though, it’s not what Twitter claims to want to be. At its best, as happened this week, Twitter is a enabling tool. But it wants to be — or at least its investors want it to be — a consumer-facing platform. Journalists love Twitter, and now Periscope, because they’re very effective news-gathering and news amplifying tools, as C-Span proved this week. But other types of enterprises also leverage Twitter, for customer service and support, marketing and PR, and other functions. Yet Twitter has never really developed a business model for capturing any of the value it helps create for other enterprises. Instead, it has focused, Quixotically, on trying to achieve enough scale to compete with Facebook and YouTube for consumer-targeted advertising. But its difficult to use interface and at times inscrutable argot has limited Twitter’s appeal to the mass market and it has yet to persuade marketers that advertising on the platform delivers a meaningful return. The reasons for Twitter’s misplaced focus are obvious enough. Silicon Valley VCs, to say nothing of Wall Street, prefer to invest in consumer-facing platforms over B2B utilities. B2B businesses tend not to scale rapidly and they don’t provide quick exits for VCs. So, under pressure from investors, Twitter has gone panting after Facebook, falling ever-farther behind. As it is, Twitter will probably take what happened this week. Periscope’s live streams dominated news coverage of a major political event, crowding out Facebook Live. The publicity Periscope’s live-streams generated comes just as Twitter is gearing up to try to sell $50 million in consumer-targeted advertising in the NFL games it will live-stream in the fall and goes in hunt of additional live events to license. It would be a strange irony, though, if evidence of what Twitter is best at became reason to pursue what it’s not.